"...[A]ll the music I assembled for this recording was intended to inspire or allude to dancing; albeit maybe an abstract style," says drummer Mike Reed in the liner notes to A New Kind of Dance. 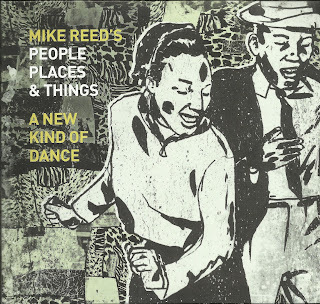 Sure enough, Reed launches the title track and the sixth People, Places & Things album with a swinging, syncopated-funk backbeat. It won't be mistaken for an attempt at mainstream jazz, though, since the tune also has pianist Matthew Shipp sitting in with the Chicago group, stretching and rolling over his keys. In fact it takes a few measures to find the One in Reed's groove. Right as that happens, saxophonists Greg Ward (alto) and Tim Haldeman (tenor) fire the staccato theme of the head and disappear just as quickly, letting Shipp take the first solo. Shipp and trumpeter Marquis Hill each join the quartet (which includes bassist Jason Roebke) on a set that splits evenly between Reed compositions and a few well-picked covers that reach beyond the group's original source of inspiration. The results yield a set that shifts gears on every track without letting the energy or focus wane. It indeed can inspire dancing, if only in your head. The group follows the opener with "Markovsko Horo," a traditional Bulgarian folk dance that sounds like rubato klezmer music. Hill adds color to the music that recalls Don Cherry's tartness. Rather than opening it up for solos, Reed ingeniously cuts it short, wrapping up after the theme and an accelerando that gives the horns a few quick moments to blow. The music goes to South Africa for the bright "Kwela for Taylor," written by reedist Michael Moore (of ICP, Clusone Trio and others). The late South African musician Sean Bergin is remembered with his "AKA Reib Letsma," where the backbeat gets even more pronounced and the saxophonists blow in unison and in shrieks of joy that dance around each other. The only problem with this track comes with the abrupt ending, right as Roebke and Reed seemed to be getting into a heavy breakdown. Before they get to that number, they also do some serious business to "Fear Not of Men," originally done by the rapper Mos Def, and "Star Crossed Lovers," an Ellington/Strayhorn number in which Ward, Haldeman and Hill are left on their own for two minutes, largely playing off the theme, with gentle backing from Roebke. As good as the interpretations sound, Reed's own writing should not be overlooked. "Candyland," Ornette-ish in both the theme's delivery and brevity, brings out the best of the quartet with some blowing that sounds like a throwback to the original era of the New Thing - complete with new excitement. Both do the same on the free-wheeling "Wonderland." Shipp gets his Andrew Hill on in "Jackie's Tune," stopping you in your tracks to consider where these great ideas are coming from. To make a short story long, there isn't a dud on this album. Far from it. I need new glasses. Badly. Thanks. Correction has been made.